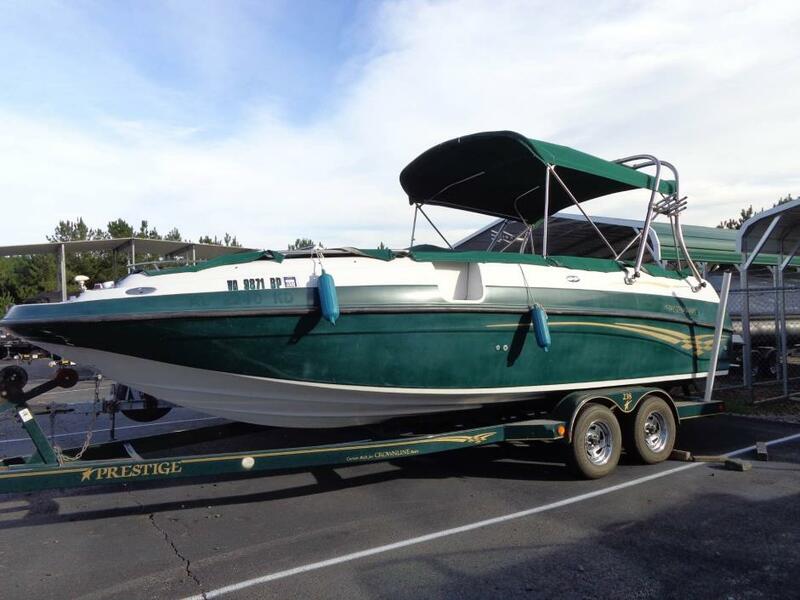 2000 Crownline 238 DB This unit is being sold "AS IS" with NO warranty. Engine compression was performed and fell within factory specifications. New cap and rotor and spark plugs have just been installed. The following things are NOT working on unit: interior lights, GPS, fresh water system, dash gauge lights. Trailer is NOT road worthy has major rust on support beams and all four wheel bearings need replaced. More pictures coming soon! 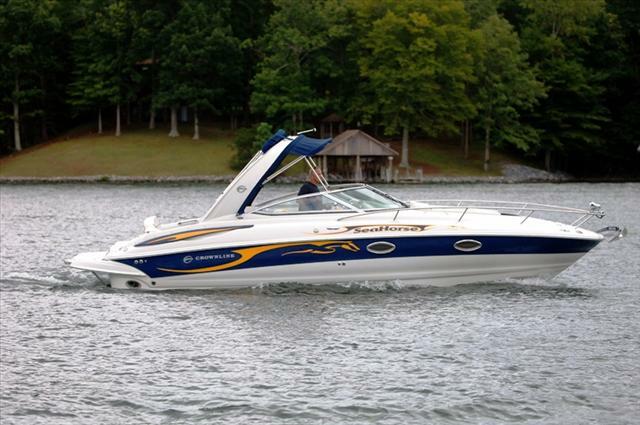 The Crownline 238 DB has a built-in cooler storage and serving area. Integrated steps make access to the forward platform easier. The 238 features a vented enclosed head with sink, light, and portlight window with screen. The helm station is equipped with a standard wind deflector and optional wood grain accents. 2006 Crownline 220 CCR You are looking at a 2006 Crownline 220 CCR. You will not find a used boat of this year in better condition. She is a Freshwater boat and has been meticulously cared for. 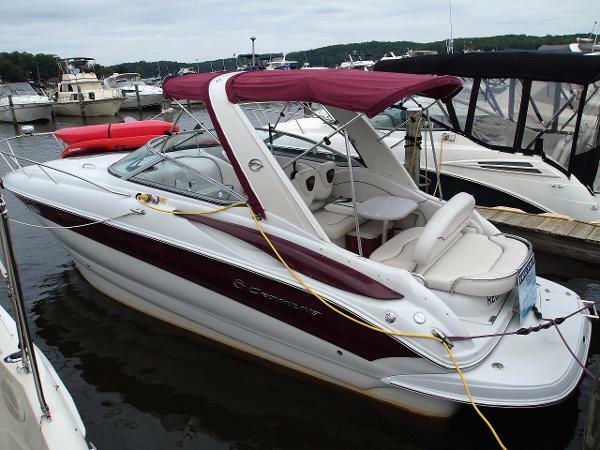 This Crownline is powered by a Mercruiser 5.0 MPI with only 170 original hours. She is loaded with options to include Cockpit Carpet that has never been used, Full Camper Enclosure that is like new, GPS, Fishfinder, VHF Radio, Cockpit Cover, Bimini Top, Dual Batteries, Rod Holders, Extended Swim Platform, Marine Head, Saftey gear and much more. Best of all the Trailer is Included. This boat is priced below retail. 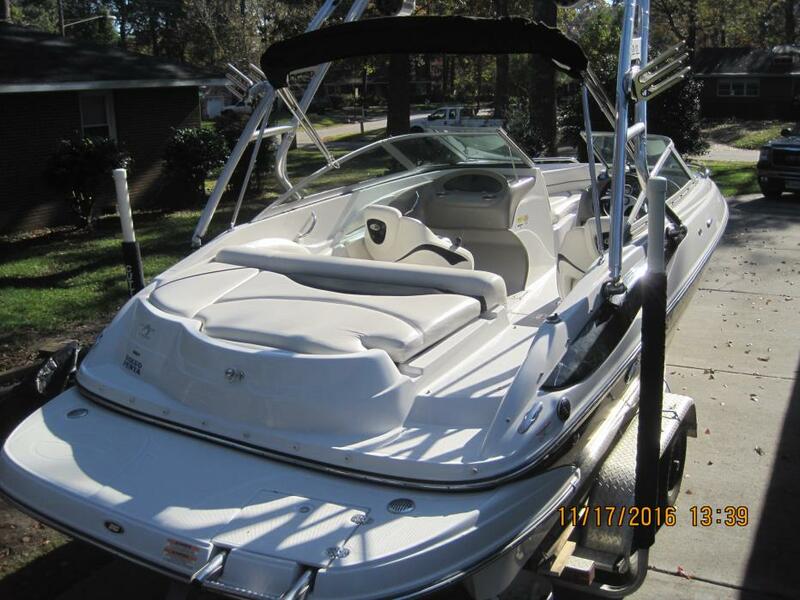 2015 Crownline 350 SY HUGE PRICE REDUCTION! 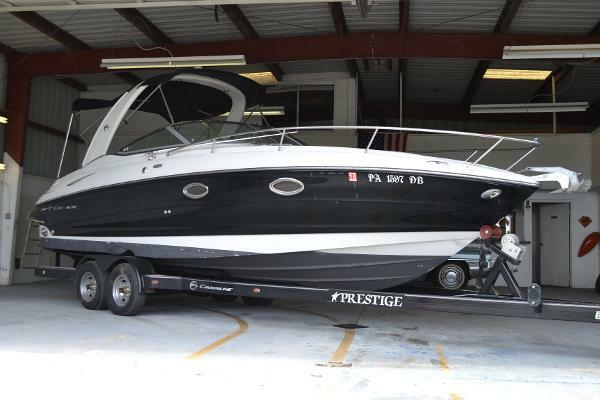 !This beautiful, freshwater use, original owner, Crownline 350 SY sport cruiser equipped with twin Mercruiser 8.2 MAG 370hp (FWC), DTS, Axius System, Bravo3 outdrives, provides performance and reliability while cruising or at the docks. Notable equipment includes; SmartCraft System, Raymarine Touch-screen GPS, Lenco trim tabs w/helm indicator, Kohler 5.0KW w/soundbox, Fusion Audio System, fire suppression system, SS cockpit grill & fridge, is the short list of options.This outstanding Crownline 350 SY with a large hardtop, full enclosure, well-equipped helm, beautiful cockpit area that provides comfort and style for a crowd with a fully equipped wet-bar, plenty of cockpit seating and storage, and a large lounge seat beside the helm. Moving into the cabin the beautiful hardwood, stairs, flooring, cabinetry, and salon table highlight and compliment the open salon with a large V-berth forward, full beam mid-cabin, and a well thought out head with a teak shower seat and wand make for a great time on the water. 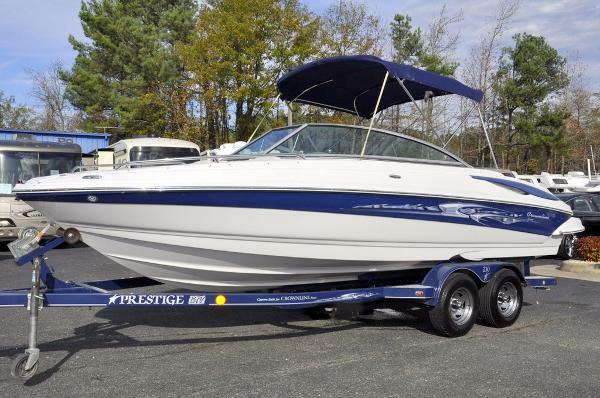 2009 Crownline 275 CCR Gorgeous Freshwater Sport Cruiser With Only 95 Hours!!! Yes Only 95 Hours On A Mercruiser 8.1L 496 Mag Coupled To A Bravo III Drive! Great Power Combo. All Lake History And Offering A Sport Cockpit With Ample Seating, Extended Swim Platform, Arch With Bimini Top, And Full Enclosure, Deck Carpet, Underwater Lights Captain's Choice Exhaust, GPS, Full Instrumentation, Trim Tabs, Stereo With Helm And Transom Controls, Ski Locker, Windlass, Enclosed Head, Twin Staterooms, Galley, Shore Power, And More! No Trailer Included With The Sale, But We Can Offer New Trailers At A Discounted Price. Great Opportunity On A Nice Boat. Inquire Today! 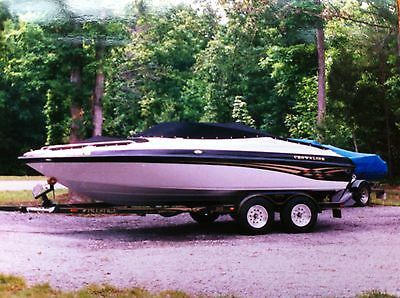 2007 Crownline 230 Super Nice Crownline 230!! Powered With A 164 Hour 5.7l V8, Extended Swim Platform W/ Fold Away Boarding Ladder, Large Rear Sun Pad W/ Fold Up Section To Reveal Carpeted Entry, Wrap Around Bench Seating, Snap In Carpet, Twin Sport Style Seats W/ Flip Up Bolsters, Beautiful Helm Station With Integrated Gauges and Easy Accessible Controls, Sony AM FM Stereo W/ Aux Input And Speakers Throughout, Walkthrough Windshield To Wrap Around Bow Seating and A Pedestal Table, Front Boarding Ladder, Stand Up Bimini Top, Trailer Included In The Sale, Definitely A Must See!! Offers Encouraged And Accepted! Inquire Today! This beautiful Crownline has been well cared for, no rips or tears in seats, hull is in excellent condition with minor scratches. All maintenance done by local dealer. Volva 5.0 GI SX 250hp engine with 250 hours. Original owner with all maintenance records. Always stored out of water in covered slip. 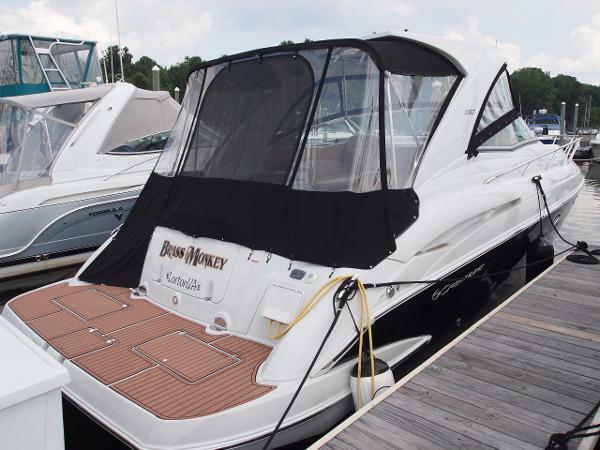 Options include: Bimini Top, Boat Cover, Cockpit cover, and bow cover. Depth finder, Cd player with 4 speakers. Docking Lights, extra prop, Swim step with 4 rung ladder, trim indicator. White with black accent. Tagged 12 passenger boat. Prestige tandem axle trailer with surge brakes, new tires, detachable tongue and custom aluminum wheels is included. 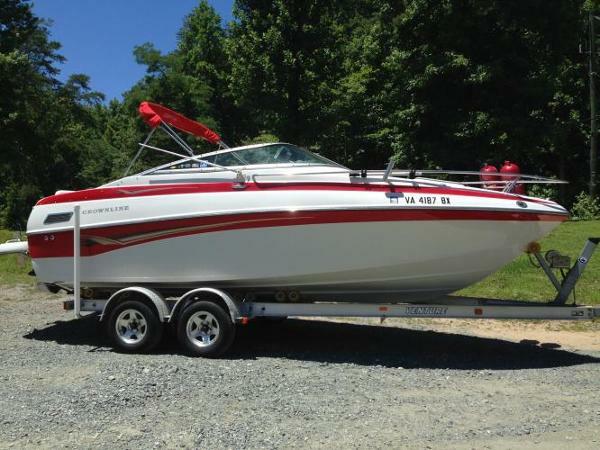 Boat and trailer must be picked up in Huddleston, Virginia unless other arrangements are provided and paid for by purchaser.